Kathy Welter-Nichols, CHT, HBCE, has been working with hypnosis, guided visualization and meditation with clients and groups for over 20 years in Canada. 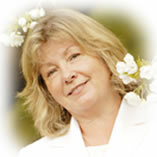 Kathy is a Clinical Hypnotherapist, a Certified HypnoBirthing Educator, a NLP Practitioner and DHE Specialist. Kathy set about creating one of the first two Circles for Cancer Patients in the Lower Mainland, in a Hospital Setting. For over five and half years she led the circle every Tuesday night, over the course of time some 13,350 people attended her relaxation meditations! Through this program she was inspired to create a variety of CD’s for adults going through Life Threatening Illnesses, Children’s meditations, and inspirational meditations. Her CD “ONE” has sold over 2000 copies in the lower mainland, just through private referrals! Kathy has trained with Dora Kunz and Deloris Kreiger the founders of TT (Therapeutic Touch), with Janet Metgsen in Healing Touch International, and most recently Marie Mongan, founder of HypnoBirthing.. She is the winner of the 1999 Volunteer of the Year Award. Kathy’s training has prepared her for the work she is currently doing. She has the ability to listen deeply, at all levels and is a deeply committed and compassionate facilitator. Her work focuses on Ways of the Wise Woman, teaching and training women in the areas of Business, Relationships, Spirituality and Birthing. Kathy’s training with Marie Mongan in HypnoBirthing. has equipped her to assist mothers during their birthing experience, bringing a deep calm and wisdom to the birthing experience and the birth room. Doctors, and midwives alike have remarked on Kathy’s skill and calming presence in the birthing room assisting mothers and fathers to create remarkable birth experiences. A student of the antiquities, her ability to “connect the dots” is one that is surprising and gifted. She creates pools of knowledge that allow individuals, to take a moment and consider that things might just be easier than we think! Her talents in understanding the past as it links to our lives today, gives Katherine a unique insight and wonderful excitement as she presents possibilities and solutions based in practical applications in today’s world. Her Ways of the Wise Woman is profoundly focused on taking women back into their personal place of power. She is a gifted and inspired Key Note Speaker and is available to speak to your group during day or evening schedules. Katherine E. Welter-Nichols, is wife and business partner to Harry Nichols, living in Burnaby, British Columbia.